M&P can make custom Polyimide Machined Parts to your specifications or drawings. We have a plastic machine shop; Polyimide is one of the plastics we can use to make parts. Vespel® is a high performance Polyimide material which is formed from resin manufactured solely by DuPont. Polyimide materials are characterized by a ring-shaped molecular structure containing Nitrogen. Vespel® will not melt and can operate continuously from cryogenic temperatures to 550°F (288°C), with excursions to 900°F (482°C). Vespel® SP-1 is the unfilled base resin grade. Vespel® SP-1 provides maximum physical strength, elongation, and toughness, as well as the best electrical and thermal insulation values. Typical applications include spacers, high-temp fixtures, valve seats, balls, gaskets, insulators, and seals. Vespel® SP-21 has 15% graphite by weight added to the base resin. Vespel® SP-21 has increased wear resistance and reduced friction in applications such as bearings, thrust washers, bushings, seal rings, slide blocks, and other wear applications. Vespel® SP-21 has the highest mechanical properties of the graphite filled grades. Vespel® SP-22 has 40% graphite by weight. Vespel® SP-22 has enhanced wear resistance, lower friction, improved dimensional stability (low coefficient of thermal expansion), and improved stability against oxidation. Typical uses are the same as those for Vespel® SP-21. 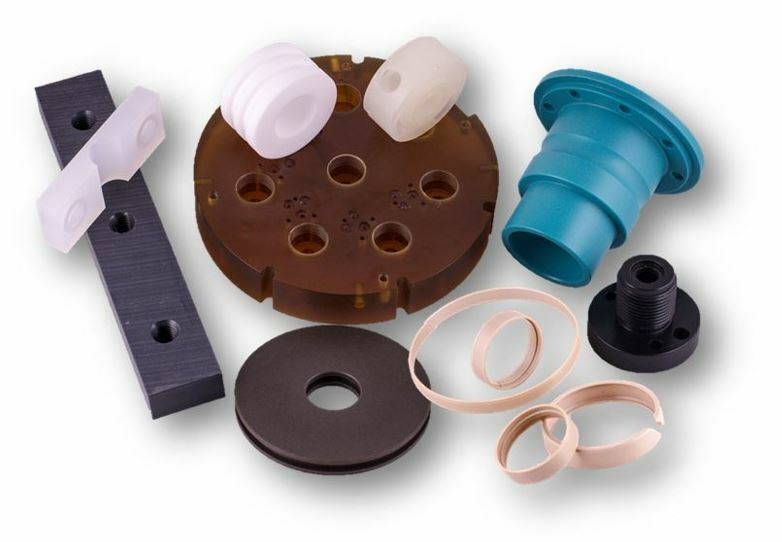 Vespel® SP-21 has 10% PTFE and 15% graphite by weight added to the base resin for the lowest coefficient of friction over a wide range of operating conditions. It also has excellent wear resistance up to 300°F (149°C). Typical applications include sliding bearings, linear bearings, and many wear and friction uses listed above. Vespel® SP-3 is 15% molybdenum disulfide solid lubricant filled for wear and friction resistance in vacuum and other moisture-free environments where graphite actually becomes abrasive. Typical applications include seals, bushings, bearings, gears, and other wear surfaces in outer space, ultra-high vacuum and dry gas applications. Polyimide Machined Parts are made in a completely controlled environment. Polyimide O-rings, Polyimide Seats, Polyimide Bushings, Polyimide Bearings, Polyimide Guide Blocks, Polyimide Wear Pads, Polyimide Washers. Vespel® is a registered trademark of E.I. du Pont de Nemours and Company.